I've always wanted to bake and construct my own Gingerbread House and these feelings especially tend to crop up around Christmas time. 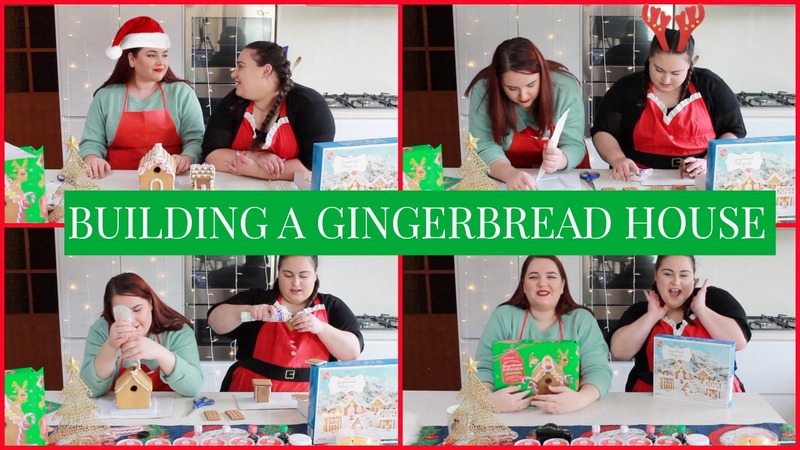 Naturally, I thought I would kick off the Christmas festivities with a cute little collaboration with a fellow YouTube friend, Melissa Bubbles. I am sure most of you are already familiar with our banter from previous videos but when the two of us get together to film, we are an unstoppable laughing machine! So... we may have cheated a little and used the store bought construct-your-own Gingerbread Kit, but I promise, you did not want to see us making these from scratch- we had enough trouble constructing them from a box! Have you ever tried to construct your own Gingerbread House? Was it a success or a complete flop? I always love to hear your stories! Haha thanks so much! They are so fun to make! Thanks so much Kiki, I think it will definitely help get you into the festive mood! Geez your enthusiasm for Christmas is somewhat rubbing out on me. I actually hate gingerbread but wouldn't mind decorating a house (not a whole village lol!) I can't decide which one I like best sorry, what I will say is I am amazed that you managed to get the house done with so little icing! Haha I have been pining for Christmas since August this year! Mmm... kind of craving gingerbread now! Haha omg such banter! I think I could seriously make an entire video of bloopers! Haha aww thank you, you're so sweet! I never made a gingerbread before but it looks so fun. But eating it is fun too :) Great vlog! Thanks so much Alyssa, it was so much fun! Haha thanks so much Stella! I'm sure if you gave it a go, it would turn out great! I'm all about the fairy lights, I think it especially helps to get one into a festive mood! You should definitely try and make your own! I can't watch the video, each time I hit play, an error message pops up. :-( But dang you girl decorate those gingerbread houses like a pro, I'm seriously impressed! Aww no, I hope you can eventually get a chance to come back and watch it! Thanks so much Shireen! Totally fun vlog! The gingerbread houses looks so delish! Thanks so much Alyssa, I'm glad you enjoyed it! The gingerbread houses look so cute. VLOGMAS #4: Emotional on Christmas Eve! Vlogmas Fail & I GOT SNAPCHAT!